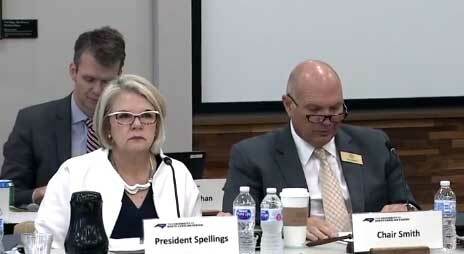 UNC President Margaret Spellings and UNC Board of Governors Chairman Harry Smith during the board’s most recent meeting. According to a report in the Austin American-Statesman, UNC President Margaret Spellings could be among those being considered to head the 14-campus University of Texas system. The University of Texas regents are meeting Saturday and are expected to name one or more finalists. Spellings’ family moved to Texas when she was in grade school. She is a graduate of the University of Houston. She worked under Texas Governors William Clements and George W. Bush before becoming part of the later’s presidential administration as Secretary of Education. Spellings became president of the UNC system in 2015 but has had a rocky tenure, clashing with members of the UNC Board of Governors. A particularly conservative faction of the board, which has been highly critical of Spellings, has come to power in the last two years. The new chairman of the board, Harry Smith, is among those who have publicly clashed with Spellings. Most recently, Spellings butted heads with board member Tom Fetzer over his revealing the name of a finalist for chancellor of Western Carolina University to a private agency run by a friend of Fetzer’s who conducts background checks. The candidate, who Spellings had selected from a group of finalists, withdrew their name leading to acrimony and cross-accusations on the UNC board. Smith defended Fetzer’s actions, saying he didn’t believe he meant any harm and had the right to seek and distribute information about candidates during the search process. Spellings said she was concerned about confidentiality, which she said is always paramount in an executive search. Goodbye Republican Toady ….. Go peddle your gop groveling in Texas where you belong….